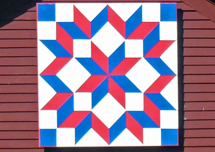 The idea for the barn quilts came about in 2009 when a member of the Sheldon Raiders Homemaker’s Club was traveling cross country and passed through Elkhart County Indiana. The beautiful designs and creative patchwork of colors displayed on barns inspired this determined lady to lead her group in this ambitious project. The Sheldon ladies shared their success story with the ladies in Richford, then Enosburg, Franklin and beyond. This created an explosion of barn quilts which has blanketed Franklin County as well as other areas of the state.